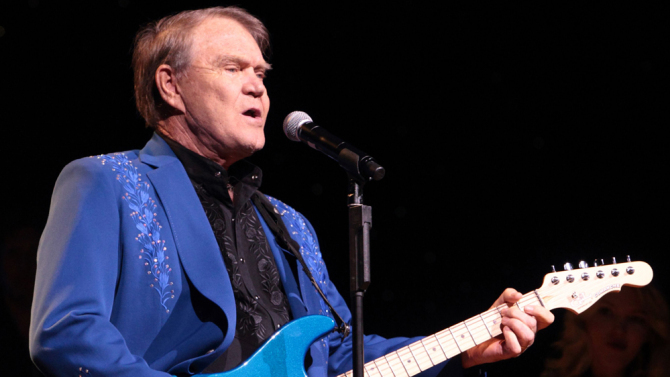 After a long struggle with Alzheimers disease, Glen Campbell died this week at the age of 81. Of all the celebrity interviews I’ve done, the two I did with Glen Campbell are among my very favorite. For openers, it’s always as surprise that a star of his caliber was willing to talk with little, old me. For some reason, the first interview we did with him took place fairly early in the morning in advance of a show that night in Chester Fritz Auditorium in Grand Forks. Perhaps he wanted to hit the golf course, I don’t know. After the interview, he invited us to have breakfast with him at the Holiday Inn coffee shop. I headed for a table in the middle of the room. But he said, “Let’s sit over here.” A table in the corner where he sat with his back to the room. I remember thinking that’s what fame is. Avoiding too much attention. Having breakfast with Glen Campbell is not the worst way to start a day. He was especially proud of the lineup of his show that night, which included John Hartford, who wrote one of his biggest hits “Gentle on My Mind.” Also now gone. And Jim “Spiders & Snakes” Stafford, another fine entertainer, very much alive in Branson, Mo. The show was incredible. Did Glen Campbell ever do a bad one? A couple of weeks later when tour was over, I got a handwritten note thanking me for the interview. Pure class. Years later, I talked with him live on television when he was appearing at the Spirit Lake Casino near Devils Lake. MTV had just aired a “warts and all” Behind the Music documentary. The warts included his drug abuse and the very public spectacle that could only be described as his tramping around the country with Tanya Tucker. I had no choice but to ask him what it was like to have that sort of dirty laundry aired so publicly. Now clean and sober for many years, his nearly perfect answer, “I know what I did. It’s between me and my God.” Next question. I will always admire Glen Campbell’s openness and honesty. His talent and showmanship speaks for itself. A wonderful voice. A tremendous guitarist. A truly great entertainer.